I was lucky enough to have been invited to see The Secret Life of Pets last night, and it was so fun! What a cool experience to see the movie at a special screening before everyone else gets to see it. The Honeybadger and I put on fancy dresses and hit the road. We have been looking forward to this one for awhile. I remember seeing the first preview, months ago, and recognizing some serious comedy heavy hitters. Louis C.K., Kevin Hart, Ellie Kemper (one of our faves from Unbreakable Kimmy Schmidt), Albert Brooks, Dana Carvey, Jaime Camil (Rogelio from Jane the Virgin) are just a few of my personal favorites. I wanted to love it, I really did, but it fell short for me. The cast was fantastic and there were some really great moments. I loved Gidget, by Jenny Slate, and was moved by parts of the story, but found myself wondering when it would end. My six year old found the story to be a too intense for her taste, she said several times that she was scared. Coming from a kid who rolled through Star Wars like a boss and shed no tears for Bambi's mom, that's saying something. 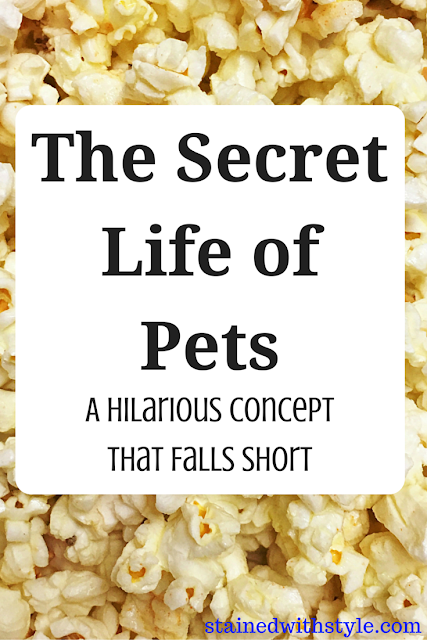 A point in favor of The Secret Life of Pets was that she was worried enough about the characters to be fearful for their safety. A point against is that they did not have more fun with it once they got her to care. I was glad that the poop jokes were over the Honeybadger's head, but the older elementary aged kids will get a kick out of that part. When I asked her afterward, she thought it was pretty funny. During a year with the Jungle Book, Finding Dory and Zootopia, this one isn't worth the money. Wait until it's on Netflix, and you are forced to watch it 10 zillion times at home.